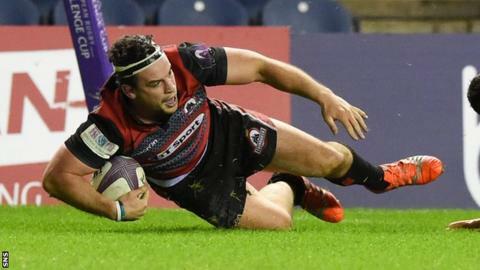 Alan Solomons praised his much-changed Edinburgh side for grinding out a "vital" European Challenge Cup victory over London Irish. Though able to recall several players who missed last week's hammering by the same opposition, Solomons remains without numerous first-team forwards. "We are seriously de-powered with the injuries up-front," he said. "Coming off the back of last week with the injury toll we've got, it was good to get the win." In blustery conditions at Murrayfield, the South African stressed his side ought to have capitalised on opportunities to harness the wind and gain field position - particularly in a second half during which the Exiles camped in Edinburgh's 22 for long periods. "I thought there were some positive parts of our attacking play," Solomons told BBC Scotland. "I thought we made a number of silly little errors, but the big thing was there were two or three occasions when we had an opportunity to put it down there and play territory, because the wind was quite strong. "Maybe not at ground level, but once it got up into the air, it carried and you could see that in the first half. "I don't think we did that in the second half. Had we done that, I think it would have been a big difference. "I thought, if we had territory, we would convert it into points, but we just didn't have enough territory. "Once we got into their half, I felt we could get the points and most times we did get the points unless we did something stupid." Solomons lost key pair Matt Scott, the Scotland centre, and second-row Anton Bresler to injury at half-time but is confident both will be fit to play in the forthcoming 1872 Cup derby double-header with Glasgow Warriors.